Fabian Coulthard made the most of a poor start from team-mate Scott McLaughlin to end his victory drought in the second leg of the Winton SuperSprint. 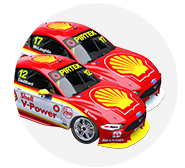 At the end of the 200km contest, Coulthard took the flag 11 seconds clear of Shane van Gisbergen, who charged from seventh on the grid to prove the Shell Ford’s only threat. Polesitter McLaughlin dropped to eighth on the opening lap but recovered to third, minimising the damage to his championship lead. Rick Kelly failed to repeat his opening-race heroics, but banked a solid fourth ahead of Nissan team-mate Michael Caruso, and yesterday’s second-placed man Scott Pye. 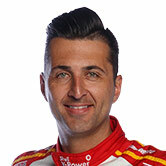 For Coulthard, it was his first Supercars victory since August 2017 – a full 22 races ago – and marked a strong turnaround from a tough start to the season. “It was fantastic. I can’t thank my guys enough,” said Coulthard, who became the eighth different winner in 14 races during 2018. “The Shell V-Power car was on rails today; it was a pleasure to drive. Van Gisbergen, who had been involved in a contentious clash with Mark Winterbottom in ARMOR ALL Qualifying, relished his fight in the race. “I haven’t driven that hard for a long time,” he said. “Just pushing hard the whole way, the car was awesome. We had a fantastic weekend, top points [for the weekend after third on Saturday]. 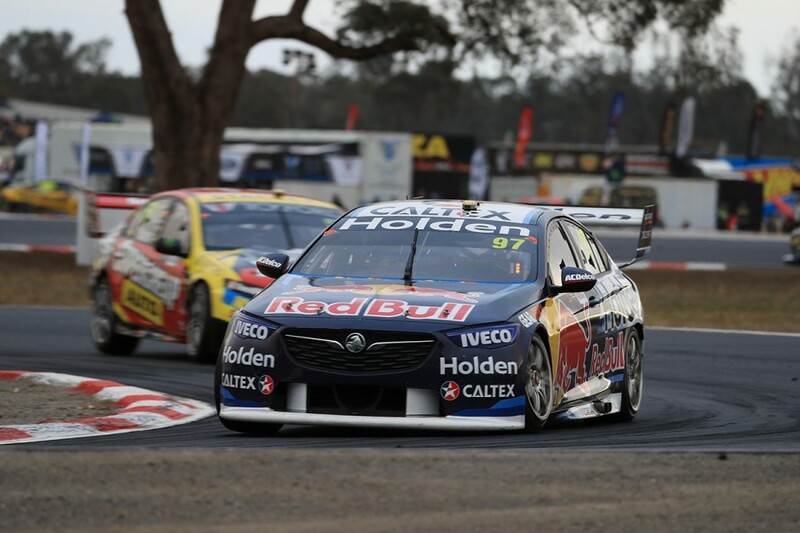 Coulthard made the most of his team-mate’s poor getaway to lead Caruso, Kelly, Chaz Mostert, Pye, Jamie Whincup and van Gisbergen through the opening corners. McLaughlin had entered Turn 1 level with Pye but, out of position, was shuffled behind the Red Bull entries through 3 and 4. The Shell team reacted by pitting McLaughlin on lap four, short-fuelling the #17 Ford, which was immediately the fastest car on track when it returned. Surprisingly, the none of the front-runners covered the move, with third-placed Kelly the next to pit a full six laps later. Caruso, Pye and Whincup all pitted in the next two laps, returning to the track in that order, all behind the charging McLaughlin, but in front of Kelly, who’d taken a long fuel fill. Coulthard, van Gisbergen and Tim Slade ran extended first stints, finally pitting together on lap 21. When the stops shook out Coulthard led McLaughlin by just over a second, with Caruso, Pye, Whincup and Kelly giving chase. Coulthard pulled five seconds clear of the chasing pack before McLaughlin, Caruso and Pye took their second stops together on lap 29, one lap after Kelly, and one before Whincup. After those stops, the order was McLaughlin, Kelly, Caruso, Pye and Whincup – settling in for the run home while Coulthard, van Gisbergen and Slade again stretched their stint. Coulthard finally took his second service on lap 38 and dropped back in with a comfortable, seven-second advantage over McLaughlin. Van Gisbergen followed four laps later and emerged three seconds behind McLaughlin, who had in turn pulled clear of the Nissans. The 2016 champion closed down McLaughlin and made a clean pass for second on lap 50, by which point he was 7.5s adrift of Coulthard, who cruised to the finish. With the results, McLaughlin leads van Gisbergen by 131 points in the championship after 14 races. Rain threatened in the final stint but, despite increasingly dark skies, never eventuated. The lack of Safety Cars created some big gaps by the finish – fourth-placed Kelly completed the distance 25s behind Coulthard. Filling seventh through 10th at the flag were Slade, Whincup and the Tickford duo of Richie Stanaway and Mostert. 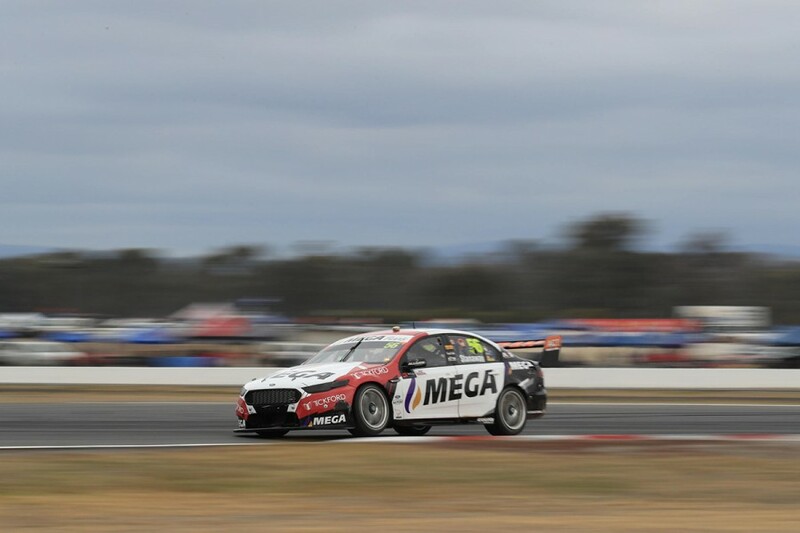 Stanaway drove strongly to convert his 10th-place grid slot into the first top 10 finish of his rookie season, while Mostert slipped progressively down the order after qualifying fifth. Andre Heimgartner started 12th and finished 11th, while Craig Lowndes performed another recovery drive, hauling 12th out of a 23rd place qualifying effort. James Courtney had a fraught race, including early contact with Anton De Pasquale and Jack Le Brocq – the latter incident resulting in the Mobil 1 Boost entry clouting the tyre wall at Turn 2. The 2010 champ then had another series of battles in the closing stages, taking the flag 14th but dropping to 19th after a 15-second penalty for spinning Garth Tander on lap 49. Cameron Waters’ horror weekend featured a driveshaft failure on the warm-up lap, the same issue that had affected the Monster Ford early in the Saturday race. He took to the track five laps down and to bank points in 26th, while team-mate Winterbottom also had a joyless outing, struggling to 20th.